Sixteen-year-old Maya is just an ordinary teen in an ordinary town. Sure, she doesn't know much about her background - the only thing she really has to cling to is an odd paw-print birthmark on her hip - but she never really put much thought into who her parents were or how she ended up with her adopted parents in this tiny medical-research community onVancouver Island. Now I have read Armstrong's earlier paranormal series and although I remember liking it a lot I never read past the second book and I couldn't remember why. I remember now, Armstrong is a fantastic writer and creates very unique paranormal romance approaches, but she tends towards the dramatic, and drama like that has just never been my thing. No fault of Armstrong, just a personal preference. Now with that out of the way (explaining why this book may not be rated as high as it might deserve), I can start saying what Armstrong did to impress me. Although the book follows a very formulatic approach to Paranormal Romance, where man others do it with Vampires, Werewolves, Faeries or Mermaids, she, as she did with her earlier series, when and found something completely unusual and almost never written about. The Gathering deals with the idea of skinwalkers, a Native American belief, and she even puts her own twist on it on top of following the legends that existed already. On top of that she goes a step even further and placed this supernatural world building inside the world building of a small town that has a pretty unusual creation and reason for being. There are mysteries popping up everywhere, and yet nothing is solved in this opening book, including the one which some might consider to be one of the most important. The characters are interesting, especially the point of view character, though as of now the main love interest feels flat in comparison to even some minor characters whom I feel are carrying a lot more secrets that I'd love to get into (luckily I have the second book on me). 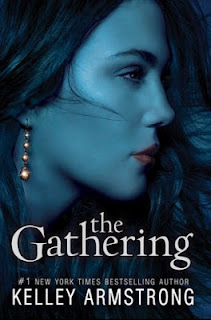 I do think that Armstrong has increased in writing ability, because I feel a lot more drive to read the next book than I had ever in her Necromancer series. I really like the way that paranormal and scifi seems to intersect in this series. It's part the supernatural/paranormal abilities and legends of the skin-walkers, and part the intervention of medical corporations doing tests and babies and then possibly the kids of the town. And of course Armstrong cannot resist a conspiracy being involved, but I love how this first book ends us wondering which conspiracies are connected and which are not, or even possibly don't exist. Of course the romance is utterly too dramatic with Rafe being hurt and leaving Maya at the end, but I can forgive that since everything else in the story, especially the complicated world building, impressed me a lot. If you like the Paranormal Romance formula, but tired of the same-old, same-old, this is a book you just must pick up and read. If you want to read some very original world building, and don't mind dramatic romances than I also highly recommend this book.